JAMMU: Governor Satya Pal Malik witnessed an exhibition Football match which was played between the Football teams of Real Kashmir Football Club and J&K Police at BSF Stadium Ploura here today. Khurshid Ahmed Ganai, K.K. Sharma, K. Vijay Kumar, Advisors to Governor; BVR Subrahmanyam, Chief Secretary; Dilbagh Singh, DGP; R.K. Goyal, Principal Secretary Home; N.S. Jamwal, IG BSF; Sarmad Hafeez, Commissioner Youth Services and Sports,Naseem Javid Chowdary, Secretary State Sports Council were present on the occasion. Both the teams were declared as joint winners of the Match which was organised by the Jammu and Kashmir State Sports Council in collaboration with the J&K Police. The Real Kashmir Football Team was presented a Cheque of Rs. 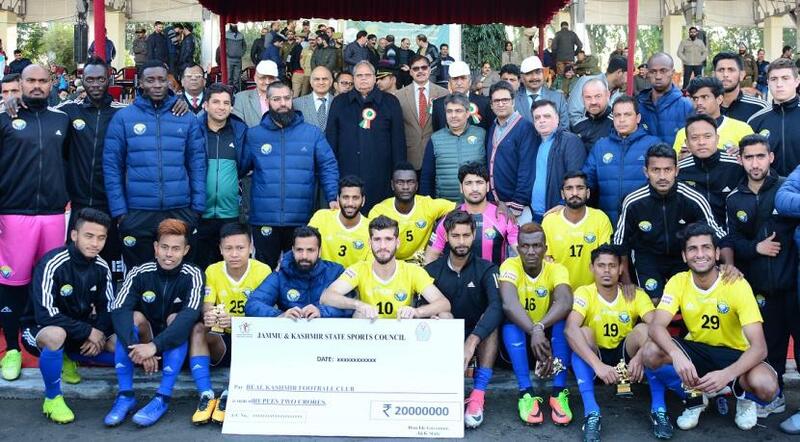 2 crores as per the decision of the State Administrative Council (SAC) which on 14th January 2019, under the chairmanship of Governor Satya Pal Malik, had accorded sanction to the grant of Rs 2 crore as financial assistance to the Real Kashmir Football Club annually for a period of three years, beginning 2018-19. The J&K Police was presented a cheque of Rs. 10 lakhs as the prize money for today's Match. Complimenting both the teams for their outstanding performances in today's Match, Governor observed that the Real Kashmir Football team has performed exceptionally well at the national level where it defeated many top-level Football teams of the country and praised the J&K Police Football Team for fighting so well against a strong team in this Exhibition match. Governor observed that performances of the Teams in today's Match generate hope for a bright future of game of Football in the State and his Administration will provide every possible support to help the players in pursuing their passion for the game. He urged the youth to take interest in the sports and extra- curricular activities for their holistic development. A large gathering was present to cheer both the teams in this Exhibition Match.